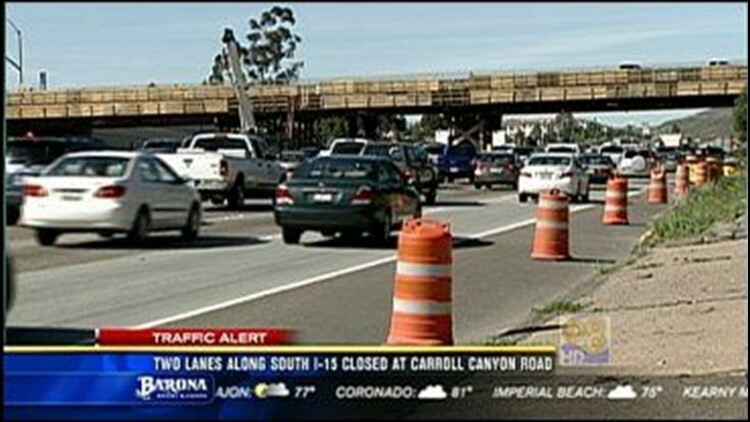 SAN DIEGO, Calif. (CBS 8) - Drivers along parts of Interstate 15 have a long road ahead of them Tuesday. Two lanes along southbound I-15 at the Carroll Canyon Road overpass are closed after a portion of the bridge was hit by a truck carrying an oversized load. Because of that, the I-15 express lane that normally accommodates northbound traffic in the evening is being reversed to handle southbound traffic. Caltrans says that will likely lead to traffic congestion on the freeway's northbound lanes as well as from Highway 163 to the 78.